Tell us a little about you and your blog/channel: My channel is about running a home so money saving, organising, feeding the family & everything else that goes along with being a homemaker. I started my blog & youtube channel when i was suffering from PND as a way of finding my voice again and getting back out into the world. It opened up so many opportunities for me and chance to meet so many amazing people! It was the best decision i could of made! That its home! I’ve lived in Aberdeenshire for more than 30 years and I love the familiarity of it! I love exploring little villages and communities across Aberdeenshire! Its always lovely to try out local tearooms and visit shops which are run by local small business owners rather than big chains! My favourite restaurant is Eat on the Green at Udny Green as a real treat!! Fennal in Inverurie has been a regular favourite for many many years!! For a coffee I love the kilted from delicatessen in Inverurie! Oh and Banchory Lodge has the most amazing food and service and holds a special place in my heart because we got married their last year! Easter Anguston Farm at Peterculter is a lovely place to spend the day with the family and is a brilliant enterprise too! Its a working farm run by adults and children with additional support needs and learning difficulties. Its a hidden gem. I am a bargain hunter & also love vintage home pieces so my favourite shops to explore are charity shops! I’m always on the lookout for great second hand stores so id love recommendations if anyone has any! Any other favourites you want to mention? I love a cocktails at Revolution in Aberdeen, they have the best selection I’ve found! The winter gardens at Duthie Park are always a fun place to explore with kids on a rainy day! Haddo House near Tarves is a great place to spend a day with the kids too and is free! Other than Aberdeen City & Shire where would you most like to live? I’d love to live in the US or Spain. Not forever but for a year or so to experience a different way of life & escape the Scottish weather for a while! Lol! Where in the world is on the top of your dream list to visit? The next country on my list of places to visit is Iceland! The scenery looks amazing and id love to visit the hot baths and see the northern lights! I love the scenery! I love that its home! I love the diversity! I love the history & feel excited for the future of Scotland too! The holiday we have just been on was my ideal holiday (not that i knew that when we booked it!) we visited Cambrils Park in Spain and it was the beat holiday I’ve ever been on and was even relaxing, with two kids, which I didn’t think was possible! Lol! Without kids i like to go places a bit more luxurious where i can relax and enjoy good food and drink! For my 30th birthday my (boyfriend at the time, now husband!) took me to the old course hotel at St Andrews. Everything about it was first class! The service, the accommodation, the food!! A total treat!! I had the best massage ever in their spa, which could never do if i had the girls with me. It was just completely indulgent and relaxing! And Andrew proposed to me which was an added surprise! Id love to go back again with Andrew! If you could order your favourite foods, what would be your ideal 3 course meal? Ooh this is a great question!! Chicken liver pate to start but it has to be homemade!! For my main I love crispy battered haddock and chips! Banchory Lodge does the best!!! And for dessert I have been loving sorbets recently! I’ve been loving quite a few series on Netflix recently but my all time fave is the Walking Dead! ‘What do you enjoy doing most in your spare time? I like bullet journalling. I find it so relaxing and i love sitting with all my pens and filling out spreads. I also like to read and of course I watch a lot of youtube!! I’m a huge youtube addict! Favourite Youtube Channel: Agh i have so many!! One of my faves just now though is Sorelle Amore! Favourite Instagram: Ooh its got to be Mrs Hinch hasn’t it!!! That woman is on fire right now!! Love to hear success stories like hers! 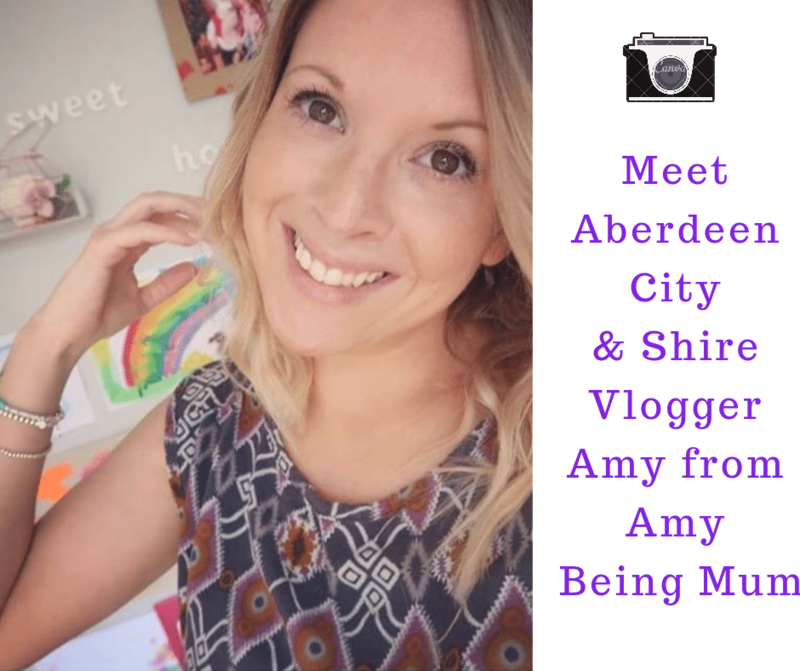 You can check out the Meet the Aberdeen City & Shire Blogger/Vlogger series here, with more to come!